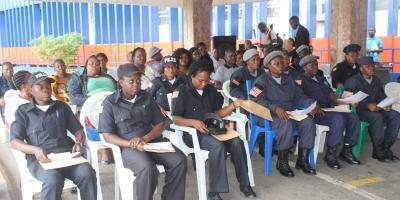 (Monrovia, Liberia) October 7, 2016 – The International Development Law Organization (IDLO) today presented the LNP Professional Development Fund Class of 2016/17, which comprises of more than forty female police officers from the Liberia National Police (LNP), who will undertake professional skills training, as part of broader efforts to increase access to justice for Liberians, in particular survivors of Sexual and Gender-Based Violence (SGBV). The launch event was attended by Hon. Gregory O.W. Coleman, Inspector General of the LNP, and forty-five female police officers, who will make up the first class of the program, which is funded by the United States Department of State. The Professional Development Fund provides financial support to female police officers to undertake professional skills courses relevant to advancing their police role or career goals. The competitive and merit-based selection process was open to all female LNP officers with at least two years of experience. Having committed to continued service in the LNP, bringing their enhanced skills and knowledge back to the workplace, successful candidates will now undertake studies in various tertiary institutions. In addition, IDLO will facilitate platforms for the class to share their experiences. It is hoped that the Class of 2016/17 will also inspire other members of the Women Police Association to pursue career advancement through education and training. Hon. Gregory O.W. Coleman, Inspector General, LNP said “for too long female officers at the Liberia National Police have suffered discrimination, pledging to give more support to skills-development and elevation on the basis of merits”. “IDLO’s interventions in Liberia are designed to support Liberian government and civil society efforts to improve access to justice for survivors of SGBV. Providing professional development opportunities for female police officers, and those other individuals working on the response to SGBV in Liberia, is an important part of this work,” explained Teresa Mugadza, IDLO’s Field Program Manager in Liberia. Under its “Promoting Increased Accountability for Sexual and Gender-Based Violence (SGBV) in Liberia” project, IDLO manages two such funds; the second is open to all individuals (male and female) working on the response to SGBV in Liberia.